The veteran Gartrell began the week with 109 career homers -- he smacked 53 in his last two seasons -- and added three more by going deep in each of Gwinnett's three games at Columbus between Tuesday and Thursday. The 28-year-old University of San Francisco product has a hit in each of his last seven games and an RBI in six of them. After a slow start -- he batted .165 with one homer and eight RBIs in 22 April games -- Gartrell seems to be back on track in his second season in the Braves organization. Donaldson, a first-round pick out of Auburn in 2007, began the season with Oakland but struggled at the plate, going 3-for-32 before being reassigned to Sacramento. The 26-year-old quickly found his stroke in the PCL, where he is 14-for-30 with four homers and 13 RBIs in nine games. This week he collected multiple hits in four straight games between Tuesday and Friday and plated at least one run in five of his six games before walking and scoring in his only plate appearance in the nightcap of Saturday's doubleheader at Tucson. 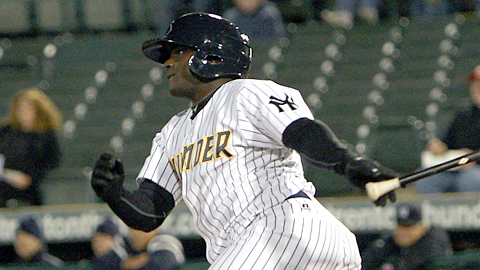 The 27-year-old Mustelier hasn't been in the Minors for long -- he signed with the Yankees last July after defecting from Cuba -- but he's convincingly shown that he can hit. After batting .333 in 31 games with Class A Advanced Tampa last season, Mustelier was batting .353 in his first 25 outings for Trenton before being promoted to Triple-A on Saturday. He capped his Thunder tenure with homers in each of his last four games and ranks second in the EL in slugging and fourth in average. Though he failed to go deep in his first two Triple-A games, Mustelier did go 3-for-9 with a pair of RBIs. Kang has lifted his slugging percentage 269 points in his second season with the Biscuits and, after four longballs this week, he has eight in 23 games this year. The South Korea native went deep 11 times in 99 games last season. Kang homered in the first three games of Montgomery's five-game set at Tennessee this week and scored nine times in the five contests before delivering a solo shot in Chattanooga on Sunday. The 24-year-old Kang leads the Southern League with eight homers and a .706 slugging percentage, as 12 of his 19 hits this season have gone for extra bases. There's no questioning Decker's power -- he hit 15 homers in just 59 games last season -- but this year the 25-year-old has cut his strikeout rate and lifted his on-base percentage 60 points while still delivering longballs for the defending Texas League champs. With three blasts and four multi-hit games this week, the 25-year-old ranks second in the league with nine homers and third in slugging. Decker is also errorless in 17 games in the outfield after three seasons spent largely at first base. The Stockton Ports have seen more than enough of Bailey already this season. The 24-year-old Nebraska product went deep twice on Friday, twice on Saturday and added a double and single Sunday as the JetHawks swept their three-game set at Stockton. Bailey is batting .375/.423/1.042 with five of his six longballs and nine of his 15 RBIs in six games against the Ports this year. Fortunately for Stockton's morale, the two clubs don't meet again until July. Aguilar, who led the Indians organization with 82 RBIs and was second with 23 home runs last season, has picked up right where he left off this spring. The burly Venezuelan is riding an eight-game hitting streak that includes a 4-for-4 performance Wednesday followed by a pair of homers on Thursday. The 21-year-old Aguilar leads the Mudcats in batting and homers while trailing only teammate Jeremie Tice (who was Player of the Week last week) in RBIs and slugging. The Florida State League seems unlikely to feature Nick Castellanos for long, as it has been wholly unable to contain him in the first month of the season. A first-round pick in 2010, the 20-year-old Castellanos is MLB.com's No. 46 prospect and currently leads the Minor Leagues with a .404 batting average. He has hits in 27 of his 29 games and multiple hits in 14 of them, including a 4-for-5 performance against first-place Dunedin on April 27. Castellanos went 8-for-13 against the Blue Jays in three games Tuesday-Thursday to help him earn Player of the Week honors. Hopkins is in his second season with the Timber Rattlers, and has found significantly more success in 2012 than he did in his first Midwest League go-around, during which he batted .229/.271/.333. The 23-year-old St. John's product is batting .320 in his first 29 games -- fourth-best in the league. He leads Wisconsin in homers, hits and runs scored but has drawn just three walks. Hopkins kicked off the week with three hits Monday, added his first triple of the season Wednesday, then went 7-for-12 the rest of the week, homering in back-to-back games at Clinton on Thursday and Friday. The Mets' 18th-round pick last June, Taijeron has been a run-producing machine for the Sand Gnats. The 23-year-old outfielder homered twice, doubled and drove in five runs at Lexington on Monday, went deep again Wednesday, then ripped off three straight three-hit games while extending his RBI streak to six games. Taijeron ranks second in the Sally League with seven homers, third with a .606 slugging percentage and seventh with 23 RBIs in 28 games.